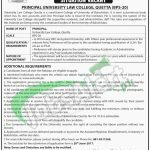 Get job offer from UOB Quetta Jobs May 2017 Latest For Principal Eligibility Criteria. The University of Balochistan is seeking for highly educated, very experienced, determined, self motivated, intelligent and well disciplined applicants are required for University Law College Balochistan to fill the post of (Principal) is the vacancy which needs to be filled by the applicants with this affiliated section of this university with LL.B qualification from any HEC recognized university with 15 year's professional experience in the similar capacity is required along with that preference will be given to those applicants who possess the LL.M/Bar at Law and Ph.D qualification as well as Administrative and Academic experience in Post Graduate Institute are the requirements of this post. Appointment will be made on contract basis for the period of 3 year's which will be extended on account of satisfactory performance of the applicants. Candidates from all over Pakistan can apply for this post. Now, I will let you know about it's further details below. The application forms are available in University of Balochistan's Website namely www.uob.edu.pk. The applicants are required to deposit the test fee of Rs.3000/ in favor of Treasurer and University of Balochistan in HBL Bank. The applications for post of director should be sent 2 sets of application with all credentials copies, C.V and recent photographs, should reach at the proper address. Last date for applying is 20th June 2017. The authority reserves the right to cancel or reject any applications form without assigning any reason. Address: University of Balochistan, Sariab Road, Quetta.